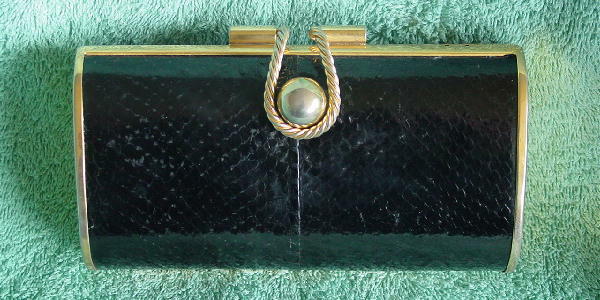 This vintage brass and black snakeskin clutch was made in Hong Kong. It has a black brushed cotton lining. There are 2 loops so you can attach a chain shoulder strap. 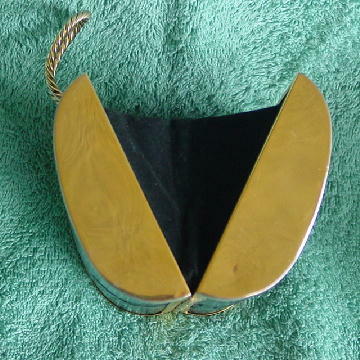 The brass sides, rim, ball and hoop closure are somewhat tarnished. The front and back snakeskin is over a metal base which gives the purse some weight to it. The back left side has a small indentation. It can be worn either in the evening or daytime.